Funny how when people object to something all of a sudden their labeled “Anti-Government”. “Today two Oregon ranchers were sentenced to five years in federal prison under terrorism statutes for setting preventative fires on their own land. We are gravely disappointed at this outcome. “Elderly Harney County rancher Dwight Hammond and his son, Steven, a former OFB Board member and Harney County Farm Bureau president, have already served time in federal prison for their mistakes and paid their debt to society for the less-than-140 acres of BLM land that was accidentally impacted by the fires. “This is an example of gross government overreach, and the public should be outraged. “Today’s verdict is also hypocritical given BLM’s own harm to public and private grazing lands, which goes without consequence. It is unjust. OFB worked on this case quietly behind the scenes with BLM through the spring and summer. That diligent diplomatic effort was fruitless. “This prosecution will have a chilling effect across the West among ranchers, foresters, and others who rely on federal allotments and permits. It will harm the positive relationship many ranchers and organizations have worked to forge with the BLM, and undermine the cooperative spirit most ranchers have brought to the bureau in helping the health of the range. “Please join Farm Bureau and declare your support for Steve and Dwight Hammond. Join over 2,600 other citizens from across the country and show BLM that this extreme abuse of power will not go unnoticed and is shameful. Sign the petition at www.savethehammonds.com. This must never happen again. First, both men were sentenced in 2012 by now-retired U.S. District Judge Michael Hogan, following the trial. Steven received one year and a day in prison for setting fires in 2001 and 2006. Dwight got 3 months for his 2001 involvement. Hogan did not believe the men had malicious intent to be labeled as terrorists under the Anti-terrorism and Effective Death Penalty Act of 1996, even though he sentenced them to jail for the time he did. “They called and got permission to light the fire… We usually called the inter-agency fire outfit – a main dispatch – to be sure someone wasn’t in the way or that weather wouldn’t be a problem,” said Dwight’s wife Susan. Federal officials said Sunday that they were monitoring the armed takeover of a remote federal wildlife refuge in the rural southeastern corner of Oregon. The occupation, which began Saturday afternoon, appeared to be led by Ammon Bundy, a rancher whose family became a symbol of anti-government sentiment in 2014, when his father inspired a standoff between local armed anti-government groups and federal officials seeking to confiscate cattle grazing illegally on federal land. The building seized Saturday afternoon houses the offices of the Malheur National Wildlife Refuge, and is operated by the U.S. Fish and Wildlife Service, about 30 miles southeast of Burns, in Harney County. Over the weekend, the group lit a bonfire by the refuge’s stone headquarters building and draped an American flag over a sign. The wildlife agency said no federal wildlife employees were in danger in the occupation. “While the situation is ongoing, the main concern is employee safety and we can confirm that no federal staff were in the building at the time of the initial incident,” a Fish and Wildlife Service press officer said. 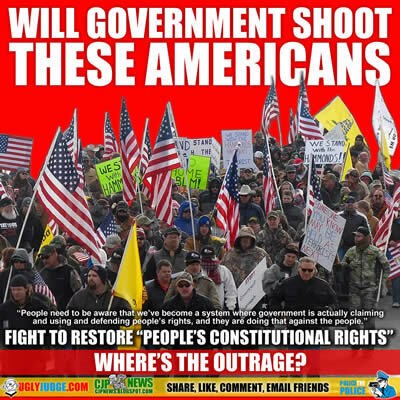 Armed anti-government protesters have taken over a building in a federal wildlife refuge in Oregon, accusing officials of unfairly punishing ranchers who refused to sell their land.